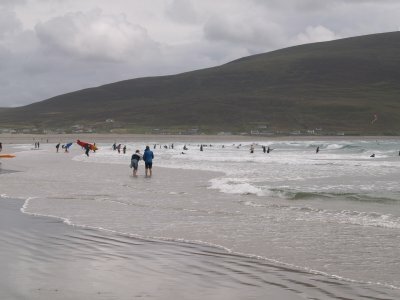 Keel Strand great location for water sports e.g. 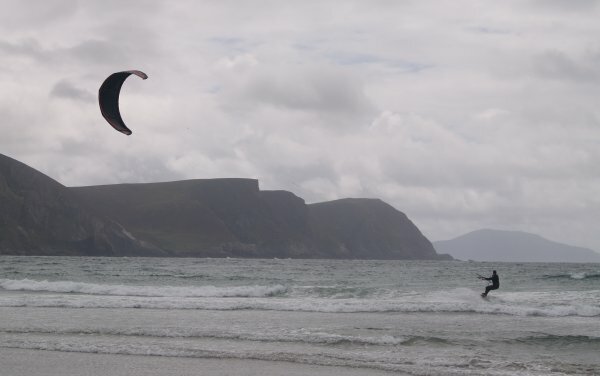 canoeing, surfing, water kiting, kitesurfing, kiteboarding (kite boarding) so lots of sightings of waterkites (water kites), surfboards, canoes etc. 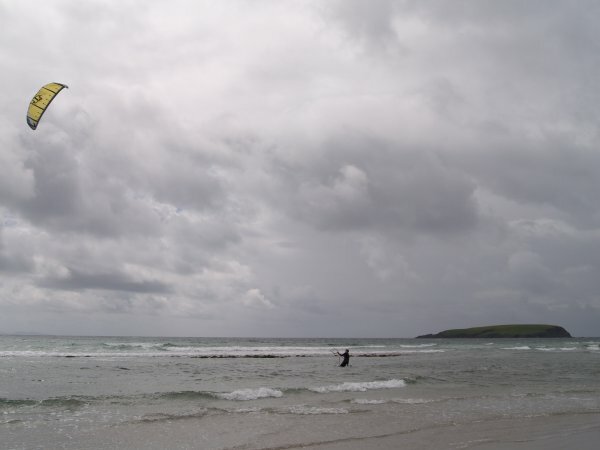 A grey day, but non of the aqua sports people seemed bothered on Keel Beach. 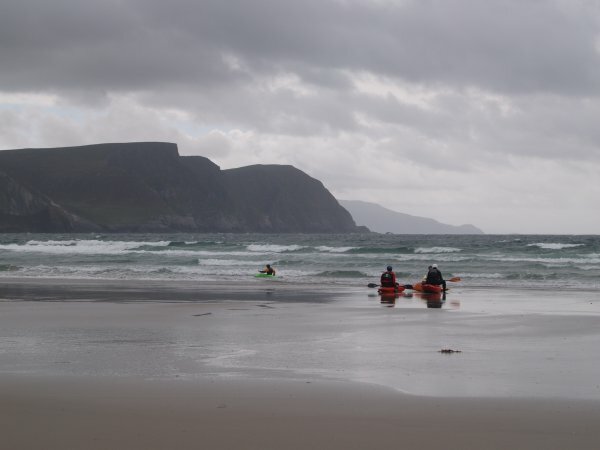 Canoeists taking a break from the surf on Keel Beach. 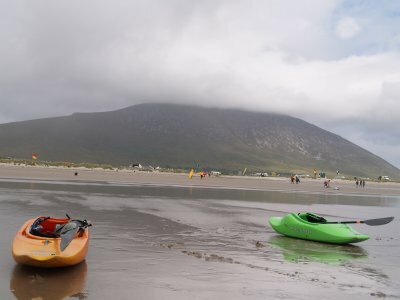 Plenty of evidence of canoeing and water surfing and windsurfing on Keel Beach. 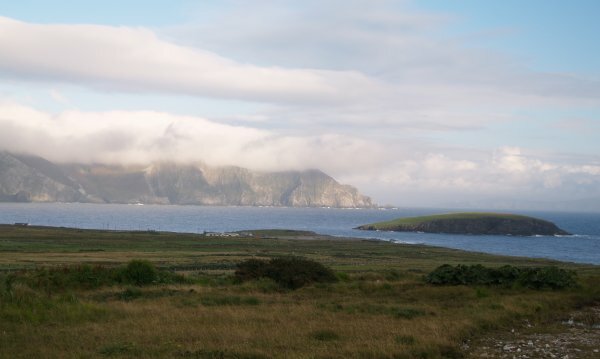 The Minaun Cliffs in the evening light near Keel Village, in fact the picture was taken from near the Achill Head Hotel at Pollagh which is between Dooagh and Keel. 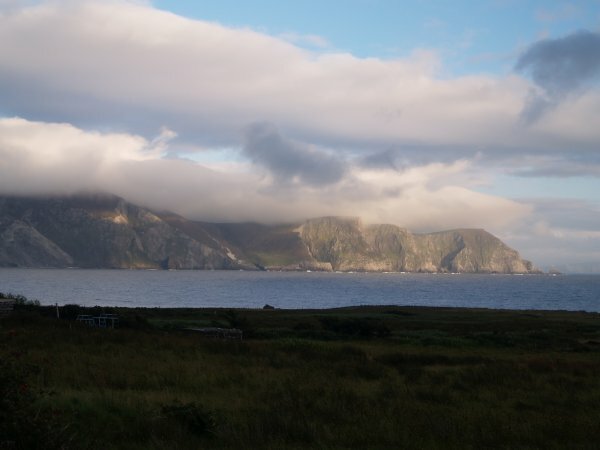 The Cliffs of Minaun in the evening light from above east of Keel. 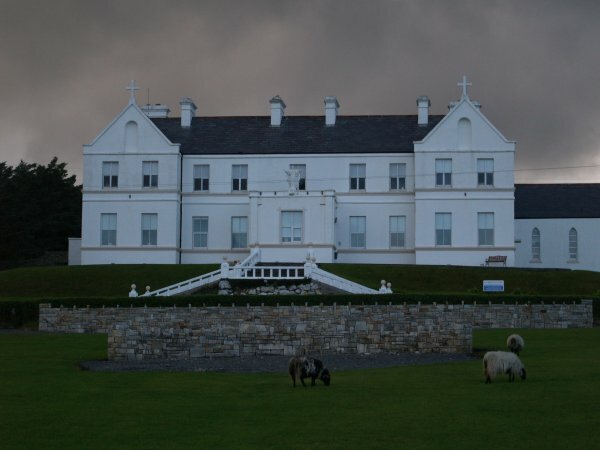 A gloomy atmosphere as the sheep cut the grass for the nuns! 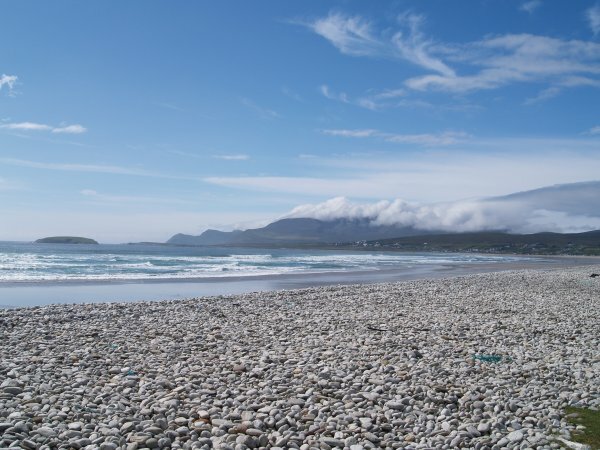 Back to Keel Beach on a more sunny day! 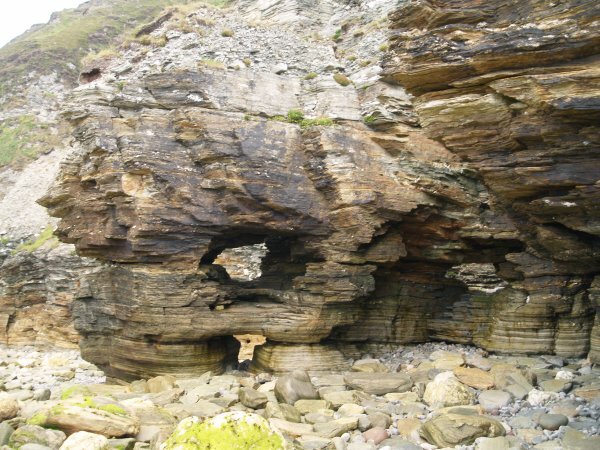 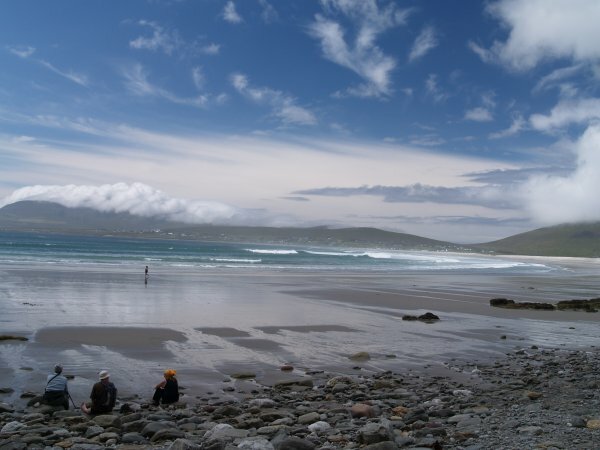 The scenery around Keel Bay as beautiful as you can find on the wild west coast of Ireland. 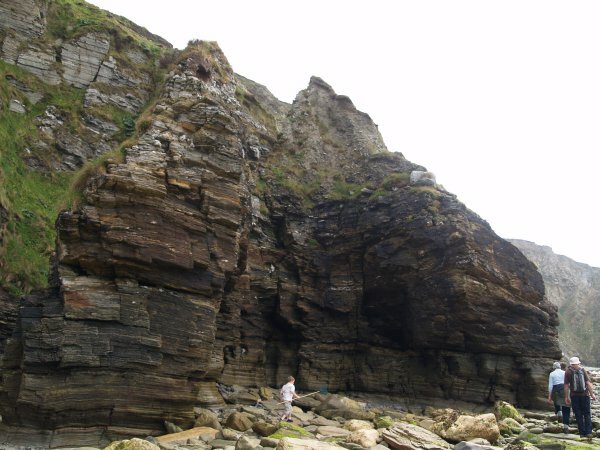 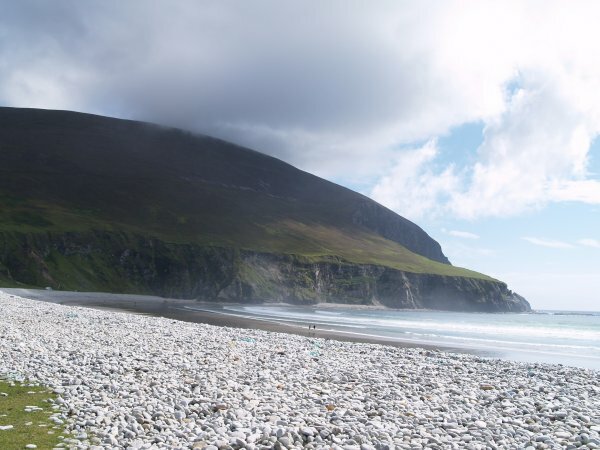 The Cathedral Rocks at the end of Keel Beach. 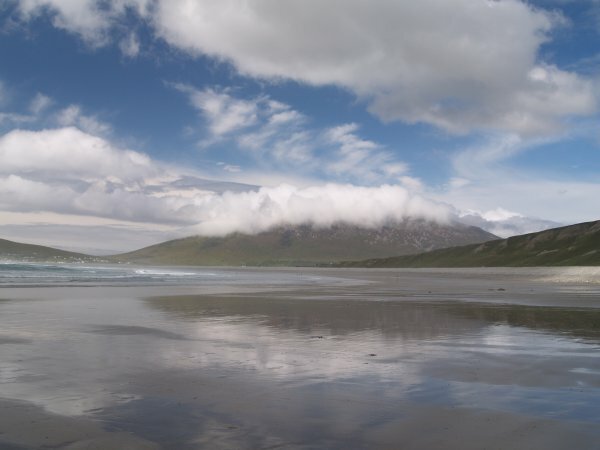 The ever changing sky and clouds above Slievemore Mountain viewed from Keel Strand. 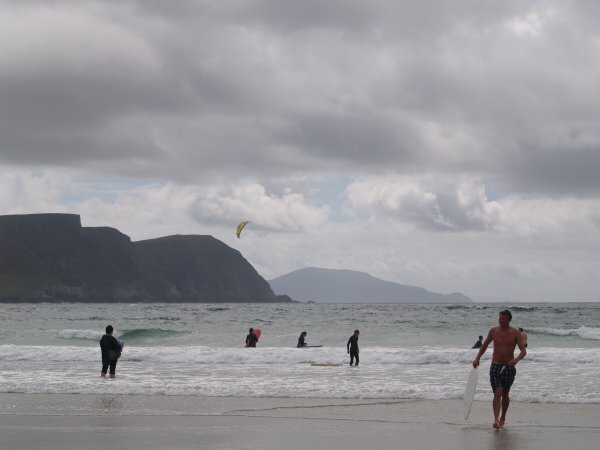 No wonder the artist Paul Henry came on a weekend trip from Dublin, tore up his return ticket and stayed for many years painting Achill Island with all its features and moods. Keel is as good a spot as any to be inspired! 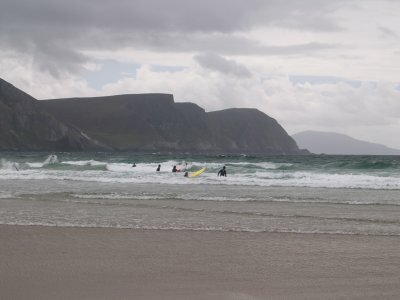 Great waves for the surfers and plenty of room for everyone to picnic on Keel Beach! 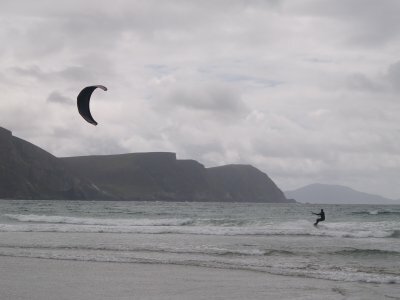 Wind surfing on Keel Lough. 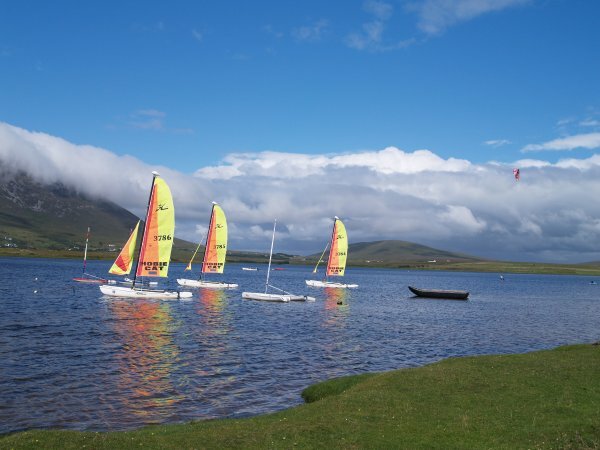 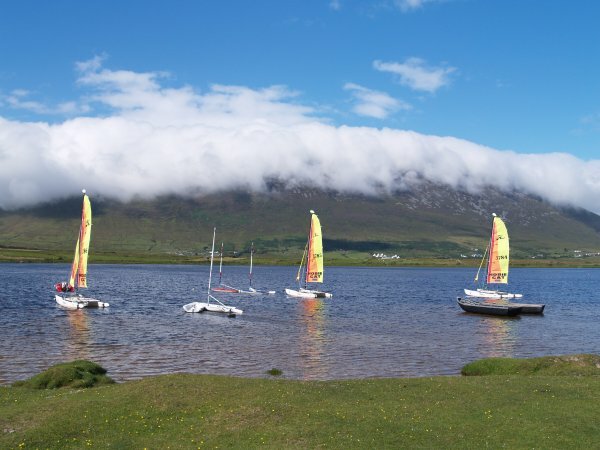 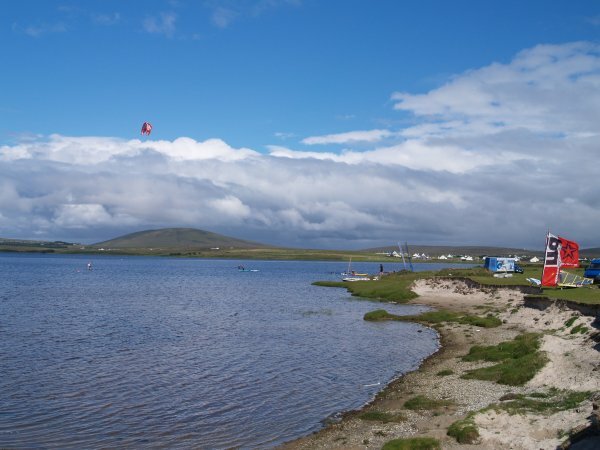 Keel Lake or Keel Lough, a safe and popular place for sailing. A currach by the yachts (dingies). 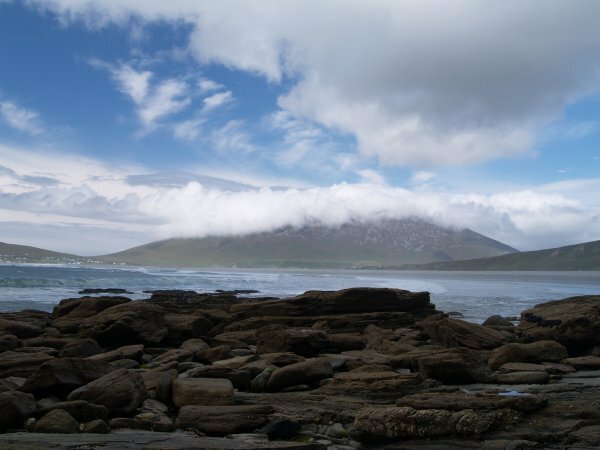 Keel, Achill Island, Co. Mayo, West of Ireland: Keel is a small village on Achill Island, County Mayo. It is famous for its 2 mile long strand-beach (Trawmore) which is good for particularly 'aerobic' swimming, surfing, sea canoeing and water kiting. 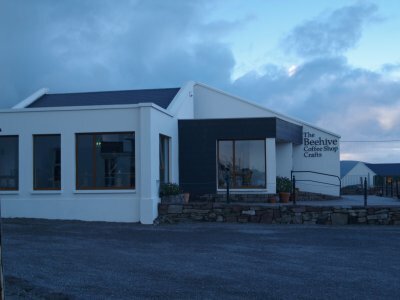 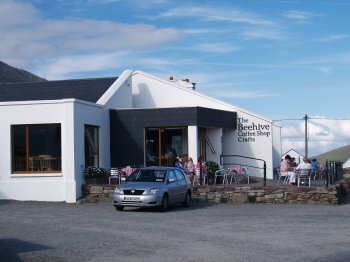 The Beehive Crafts and Coffee Shop (left) serves up good refreshments. 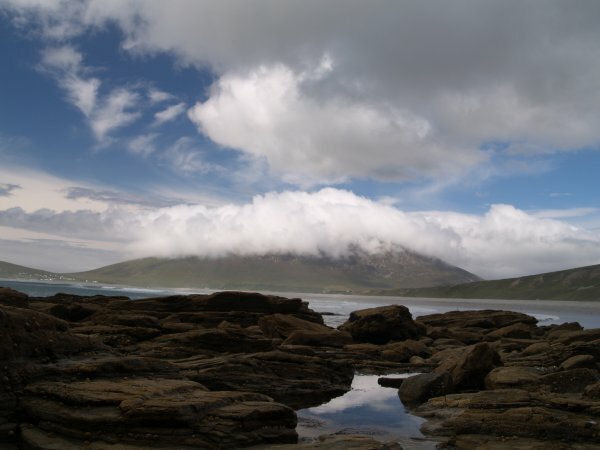 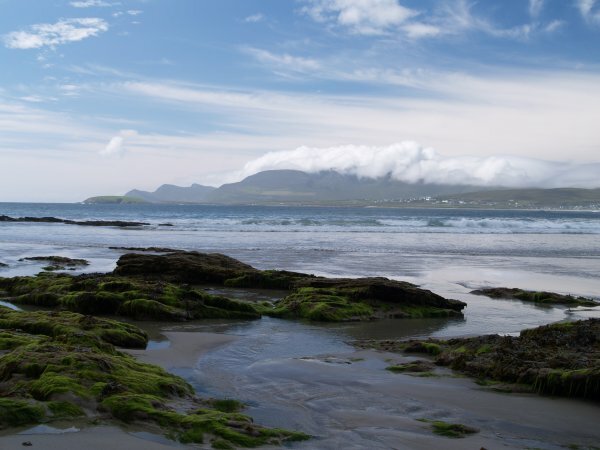 The scenery viewed from the beach is magnificent including the striking outline Menawn Cliffs below Minaun Mountain (3rd highest on Achill Island) and the 'fainter' Clare Island in Clew Bay to their right. 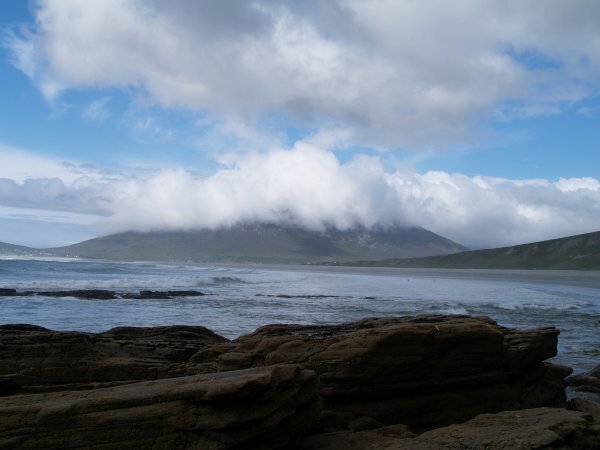 Great picnic spot! 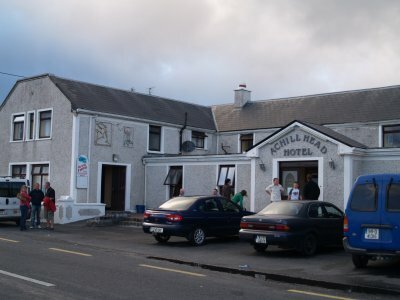 The Achill Head Hotel (left) has a bar with traditional Irish music and nightclub too! 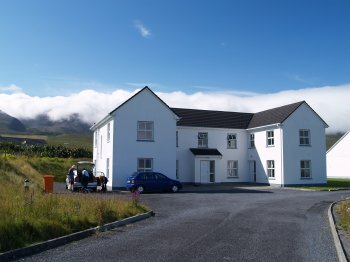 It is in Pollagh at the western end of Keel village. 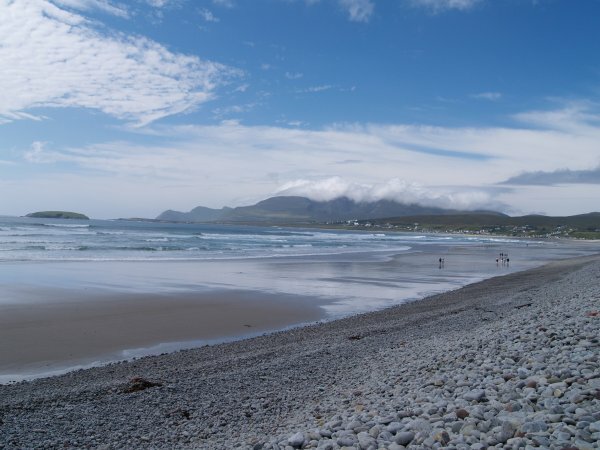 In the distance behind the beach is the tallest mountain on Achill Island, Slievemore (below, 672 m, 2205 ft high), which has a tendency to be cloudy on the top!